We are incredibly happy that you met someone wonderful through Shaadibook.in . Would you mind telling us your story? Would you tell us your story? A success story like yours can inspire people around the world. Would you spend a few minutes and tell us how your relationship started and why it's amazing? Don't worry, we won't tell anyone unless you give us permission. We would love to see a photo of the two of you. With your permission, can we share your name, photo and story? Would you like your story to be considered for an shaadibook TV commercial? Congratulations on your wonderful news! We wish you all the love and happiness as you begin your life together. We're honored that you chose our service in the first place and to say thanks. 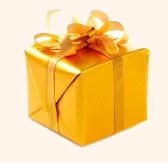 we'd like to send you a free gift .